The Music Department boasts a well-resourced music department with a wide range of instruments and electronic equipment available to all pupils for their studies at Key Stage 3 and above. All new pupils are given musical tests and information is sought from them as to any previous musical experience at Primary school or outside school, possible support of family members or other clubs or societies. This then leads to an audition with peripatetic staff, and successful candidates begin their instrumental studies. Practical music-making is thus developed and encouraged by very careful monitoring and management of the peripatetic tutors’ timetables. Making sure that boys attend their lessons on time is vital. On reaching a sufficient and competent standard, they will be invited to join the band and benefit from its practices and public performances. In the classroom, pupils are faced with a series of challenges in the areas of performing, composing, listening and appraising so as to broaden their personal responses to different cultures and styles of music and to develop their ability to work with others and on an individual basis. Music is, to a large degree, a practical subject and emphasis is placed on this aspect during teaching. To implement the programmes of study, it is necessary to employ a range of teaching strategies which takes into account a pupil’s individual needs and abilities. Individual, pair, group, whole-class and discussion work are among these strategies. The choice of strategy will be influenced by what is being taught, together with the ability of the pupils. Emphasis is placed on pupils learning through active participation where this is possible. All pupils will adhere to the school assessment policy. Their assessments will include both listening and practical tasks. G.C.S.E. Music comprises the elements of performance, composition, and listening and appraising. It has one core area of study ‘Repeated Patterns in Music’ and a choice of two further areas of study from: ‘Musical Traditions in Ireland’, ‘Incidental Music’ and ‘Vocal Music’. These areas of study are wide-ranging and incorporate a broad mix of musical styles and genres from c.1650 to the present day. Students must base one composition on one area of study and also base one performance on one area of study. I would seriously encourage students to take advantage of the excellent skills of the teaching staff at Ashfield and may its success continue. When I first joined Ashfield, I had very little musical experience. I had played with a few pipe bands never anything too serious. That was soon about to change in the next number of years as I became a member of Ashfield Boys’ High School. Within a few months, Mr Howe had spotted the potential in me and nurtured it until it became something more than just a hobby. It later became my job and I would even go as far as saying it became my way of life. The opportunities within the music department were abundant. We recorded several CDs as well as doing a song-writing course for three days. We played in many venues such as the City Hall for many esteemed guests. Many musicians who have passed through the doors of Ashfield Boys’ Music Department are now full time professionals. I would definitely say that it is a great deal to do with the excellent work and effort put in to each individual who has the privilege of being under the guidance of Mr Howe. As I mentioned earlier, my experience in music before the days of Ashfield was minimal. Now I am travelling throughout the world as a singer songwriter, a professional drum tutor and session musician. I can definitely say with confidence that none of this would have been possible if it was not for Mr Howe spotting that potential and giving many others and me the opportunities we had. My experience of the music department at Ashfield Boys’ High School as a student and as a returning spectator has been nothing but positive. I hold the services of the outside tutors for their instrumental teaching in the highest regard as well as the continuous effort of the internal music staff. Without these two factors, my study of music would have never flourished. The school band was a weekly treat for me as I am sure it was for other members. It was a fun, educational and practical way to learn music by regular performance via school concerts, carol services and other such events. Therefore, it is my opinion that the music department can only see greater success than what it has already achieved and it has become one of the finest facets of the school. Thank you for all you have done over the past year. I would not be here if it wasn’t for your influence. Hi, my name is Michael Whan. I am a former Ashfield Boys’ High School student who finished my time at the school in the summer of 2012. Throughout my time at Ashfield I had many pleasant memories and formed great friendships. Not only were these through classmates, but many of them through the school band and the music department. I went to Ashfield having a brief musical background from learning the piano and viola at an early age, but lacked the motivation to practise and push myself forward. This however all changed when I started Ashfield. 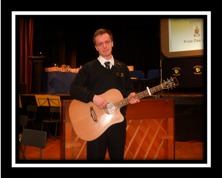 Mr. Howe (Head of Music) recognised that I had a talent from the very early weeks when I started first year, and wasted no time in getting me on board in the music department. Within a few weeks I was called to audition to play a brass instrument, which was something I had never played before. I went along and succeeded and was selected to play baritone and was taught under Bill Donnan. 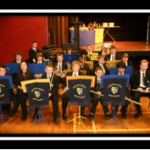 Over the course of the next year I was introduced into the school band, which really helped me find my feet in the school and make friends from different year groups. I was also encouraged to start learning bass guitar and guitar. I then found myself with a new motivation to practice and to succeed. 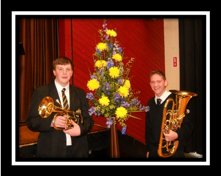 By the start of my third year in Ashfield, former tuba player Ricky Ellis had moved on from the school, leaving a vacant seat in the band. Mr. Howe and Mr.Donnan both felt it was right for me to up the size of my instrument and move on to tuba, which was quite a scary thought at first. However I thrived in playing tuba, and the move is one of the best I have made. This opened many doors and opportunities for me in years to come. I became a regular soloist for the school concerts, (strange for a tuba player, I know), and also in school assemblies. I got to perform for many of Northern Ireland’s leaders and celebrities, some of which include The Lord Mayor, Peter Robinson, and we couldn’t forget about good old Jackie Fullerton. 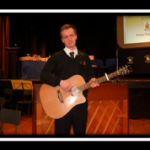 During my fifth year in which I was studying GCSE music, a Christmas concert was to be performed inside the school. This included the school band, Wildfire (the school rock group that I was in) and Downshire Brass. A good friend of former Principal and Vice Principal, Mr.McMorran and Mr. Russell respectively, is a dedicated member of Downshire Brass, called Roger Doherty. He approached me after this concert and talked to me a bit about the band, and encouraged me to come along one evening. At first I was unsure of how I would settle in, and if I would be good enough, as Downshire are one of Northern Ireland’s leading brass bands. However, after persuasion from Roger I went along and I remember sitting in the band on my first evening thinking, ‘Waow, I want to be as good as these players one day.’ This kept me returning to the band week in week out, and the encouragement from the rest of the band was incredible. I was asked to represent Downshire at one of the contests called ‘Solos and Quartets’. I was entered at U17 level, and came 4th in Northern Ireland from 17 entries. The environment of the band not only helped me as a musician, but it matured me and taught me an awful lot, especially through Stephen Doherty (principal tuba player, and Rogers’ brother) and Professor Michael Alcorn who is the musical director of the band. Not only was I strongly involved in brass in and outside the school, I was in many different rock groups playing bass guitar, performing at all major school events. This lead to me getting involved with other rock groups outside of school and groups where I could get challenged even more musically. Through the help of the school, one of the rock groups over the years, ‘Wildfire’, was funded to be able to record and release a CD. This was not only great fun, but also great experience in a recording studio, which encouraged me to continue to do a lot of sound recording and has linked to what I am doing today. After completing my music GCSE, I decided that I would continue my study of music on to A Level. In the process of completing my A Levels I was landed with the massive decision that every upper 6th student has to make… what to do next? I had always wanted to go on and do a degree in music, but I felt that I wanted to take a gap year to explore different opportunities. Having had many discussions with Mr. Howe and Mr.Donnan about my future, I decided to ask Michael Alcorn if he knew of any gap year projects for musicians. This lead on to what I am currently doing. Michael is the Head of the School of Creative Arts in Queen’s University, which of course includes music and one of the finest music technology courses in the world in the Sonic Arts Research Centre, and we discussed the possibility of me doing a year’s work experience there. I felt that this was a once in a lifetime opportunity, and invaluable experience, and jumped at the opportunity. If it wasn’t for the music department at Ashfield, I doubt I would ever have made the connection to be able to do what I am doing now. I still play in Downshire Brass where we rehearse two nights a week and compete against other bands throughout Ireland in the Brass Band Championship section. I also joined the Queen’s University Brass Band during my Upper 6th year in Ashfield. I now receive lessons from the tuba player from the Ulster Orchestra (Steve Irvine), who is the only professional tuba player in Northern Ireland, and which became available through the connection of Mr.Donnan who tutored me throughout my seven years at Ashfield. As I previously stated, some of my finest memories of my teenage years are in the Ashfield music department and school band. It matured me as a person and as a musician under the fine leadership of Mr. Howe, without whom I would probably never have got into the world of music. Due to my contribution to music in the school and in other departments, I was rewarded with the honour of being Deputy Head Boy. I often heard people say, ‘your school days are the best days of your life’, but growing up I didn’t believe it for a second. As I came to my latter years in the school and had to look at what to do next, and having made the school trip to New York City, I realised where people were coming from, and can honestly say that my years of Ashfield (not just the music department) were unbelievable, and if I could go back tomorrow, I would. What a fantastic concert! Thanks once again for all the time and preparation you put into organising such a great event. I am a former Ashfield Boys’ pupil, having attended the school from 1966 -1971. I was accepted into Stranmillis College two years later having completed ‘A’ levels and graduated as a Secondary Teacher in both Music and Physical Education. As a peripatetic teacher, my job entails travelling around both Primary and Secondary schools, including Ashfield, in the Belfast area teaching Brass instruments. 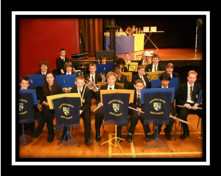 As current Head of Brass at the School of Music, I do enjoy teaching in Ashfield and I find there is an enthusiastic group of boys ably supported and encouraged by their Music teacher Mr Howe. 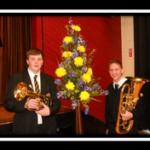 I am a brass tutor and work mainly for the City of Belfast School of Music. I currently work in 11 schools around the Belfast area and further afield. I have worked in Ashfield Boys High School for 3 years now and am into my 4th! I am involved in teaching the boys how to play brass instruments and help out with the school band. 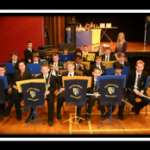 I really enjoy my time in ABHS, it is a really nice environment to work in and I am able to have good fun in the band helping the Head of Music in his role. Just a short note to thank you for the tremendous support and encouragement that you have given Michael over the last seven years. You have played a big part in his formative years, not just with regard to music but also his personal development. 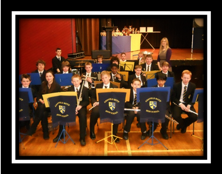 We will remember with great fondness our connection to Ashfield, especially the music department – and wish you every success in the future. Thank you so much for your dedication to music at Ashfield and especially Robbie. Just wanted to say how impressed I was with the fabulous carol service. The music and your evident inspiration for all the boys were outstanding and greatly appreciated.